Hip Resurfacing Terms used during surgery or post op surgery. 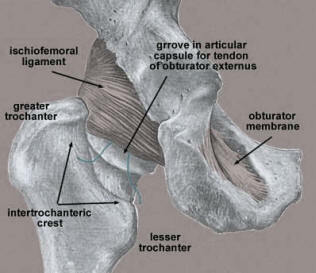 The cup of the hip in which the ball, or head of the femur, rotates when the hip is in motion. During hip replacement surgery, the acetabulum is reamed out and a metal cup is implanted to replace diseased bone. The DePuy ASR XL System is a large diameter, high performance metal-on-metal hip resurfacing device. 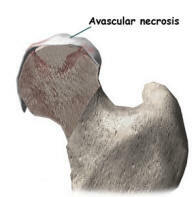 AVN is a one time event in which a strikingly similar sector of necrosis occurs in most femoral heads ( anteo supero lateral part) due to blockage of presumably the same vessel. This sets off a series of changes which are is marked by sectoral collapse. Birmingham Hip Resurfacing or BHR device by Smith & Nephew. Abnormal projections of bone, also known as osteophytes. Bone spurs are commonly seen in patients with arthritis. A device used to electrically cauterize, or burn and seal the ends of blood vessels that are bleeding into the surgical field. The strong, fibrous, flexible sac that surrounds the hip joint and contains the synovial membrane. 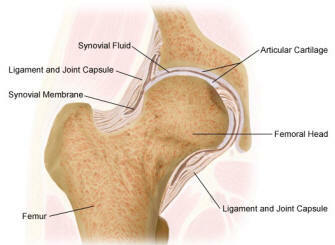 The synovial membrane produces sinovial fluid, a liquid that lubricates the joint. A smooth material that covers bone ends at a joint to cushion the bone and allow the joint to move easily without pain. A series of muscles connected to the back of the femur near the greater trochanter that are responsible for rotating the leg outward away from the midline of the body. The thigh bone or upper leg bone. The top of the femur bone, also known as the ball of the hip. 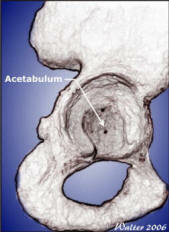 This rotates inside the acetabulum to allow the hip to move. pulled back to access the bones of the hip during hip replacement surgery. be pulled back during hip replacement surgery in order to access the bones of the hip. 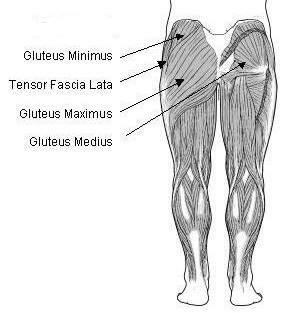 A small muscle that occurs just below portions of the gluteus maximus. The gluteus minimus is attached to the greater trochanter and is part of the flap of muscles that must be pulled back during hip replacement surgery in order to access the bones of the hip. A large projection on the end of the femur near the hip. 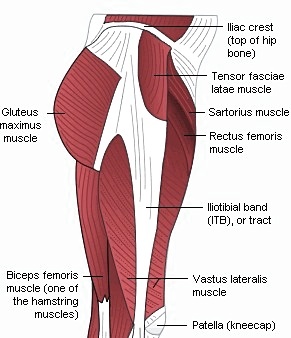 Numerous muscles attach to the femur at this location. 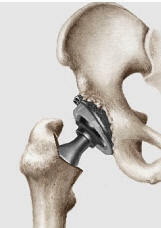 A Hemi-Hip Resurfacing is not used often today. There were many revisions required because only the femur was capped. This led to the metal cap of the femur rubbing on the acetabulum of the hip. There was not a cup placed in the acetabulum. Hemi-resurfacing was used for younger adult patients with early osteonecrosis of the femoral head, preserving the acetabulum, proximalfemoral bone, and medullary canal. The canal that runs up the center of the femur. The prosthetic stem is placed in this canal as part of hip replacement surgery. A sterile gauze pad used to absorb blood and fluids or clean surgical areas during surgery. The most common type of arthritis. It affects many joints in the body, including the hip. It is a chronic disease and is characterized by destruction of cartilage, overgrowth of bone, bone spur formation and impaired function. This type of arthritis occurs when bone rubs against bone. 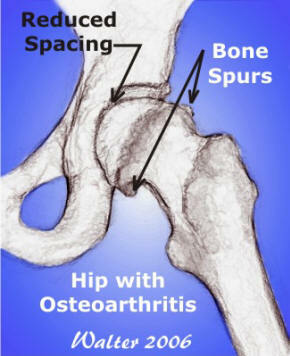 Many people develop osteoarthritis as they age. Abnormal projections of bone, also known as bone spurs. Osteophytes are commonly seen in patients with arthritis. A chisel-like surgical instrument used to remove osteophytes or bone spurs during hip surgery. This goes inside the metal acetabular cup and cushions the metal ball of the total hip prosthetic. The liner serves much the same function as cartilage does in a healthy hip – it prevents the metal parts of the prosthetic from rubbing against each other. The tendon that connects the piriformis muscle to the head of the femur. 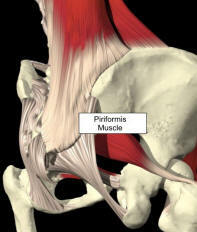 The piriformis muscle travels behind the hip joint, running horizontally from the lower spine to the top of the femur. 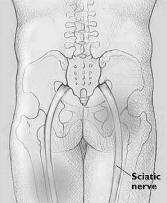 The piriformis runs over the sciatic nerve and it aids in external rotation, or turning out, of the hip joint. An artificial body part designed to supplement or replace natural parts. In hip replacement surgery, the prosthetic components replace the end of the femur, the ball of the hip (head of the femur) and the cup of the hip, or acetabulum. RA is a chronic, systemic inflammatory disorder that primarily affects joints. It may result in deformed and painful joints, which can lead to loss of functioning. The disease may also have signs and symptoms not related to joints. The acceptable amount of movement a joint should be able to perform. Range of motion tests are performed in all joint replacement surgeries to ensure that the prosthetic joints work appropriately. A surgical tool used to remove small amounts of bone by shaving or sanding the bone down. Rasps are used to size the femur to accept the stem prosthetic in hip replacement surgery. A surgical instrument used to remove osteophytes, or bone spurs, during hip replacement surgery. third, where it divides into two large branches. The metal prosthetic piece that goes in the femur during a hip replacement surgery. Literally under the skin. In surgeries, this usually refers to this usually refers to the layer of fat that exists just beneath the skin. This layer is often sutured together separately from the skin to make the surgical closure more secure. A plastic guide used to help surgeons determine the correct size of replacement prosthetics to use for a patient. 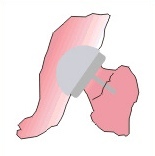 The surgeon uses the plastic template to measure the size of the acetabulum and the canal in the femur by holding it up against an enlarged x-ray. Aids in muscle movements and can also provide an attachment site for muscles and act as a cushioning layer between them. The tensor fascia lata runs from the hip down the thigh and provides stability for the leg as well as medial rotation, or rotation in toward the other leg. Also known as total hip arthoplasty. In this procedure a portion of the femoral neck and the entire femoral head are removed and replaced by a prosthesis. The acetabulum (socket) is prepared with reamers and a metal prosthetic cup is press fit in place. The metal ball on the femoral prosthesis articulates (rubs against) an acetabular liner that matches the size of the femoral head. Traditional head sizes for total hip replacement are 28-32 mm. In this procedure the head of the femur is retained and prepared with specialized reamers. The prepared femoral head has a metal resurfacing component that may or may not be cemented into position. The acetabulum has a metal prosthetic cup inserted. This type of surgery preserves more bone than a traditional total hip replacement does. Femoral head sizes for surface replacement often range from 44-54 mm (substantially larger than traditional total hip replacements).